Yes, my proclivity to make horrendous musical puns is lousy, but you will need to bear with me. This post is not about my diction. I’d prefer to preview the concert I will be attending later at B.B. King’s Bar and Grill where one of rock n’ roll’s best guitarists will be gracing the stage with his custom-built Fender Strat. I want to stress some words in that last sentence. One of rock’s BEST guitarists. You can see I am slightly disgruntled with Trower’s treatment in the world of top guitarist lists. Trower is not only a guitarist, but also a solid lyricist who began his songwriting with Procul Harum (even though he is overshadowed because the band was stacked with great songwriters). He had previously been in a band with high-school friend Gary Brooker called the Paramounts, but after they disbanded Brooker founded Procul Harum and Trower ended up on deck in 1967. If you are familiar with Harum’s maritime baroque rock, the last sentence features an awful pun. Even though Procul Harum featured a lot of dominant piano-rock, Trower shines through on some pieces like on “Something Following Me” where his fuzzy guitar solo is unique and executed well. 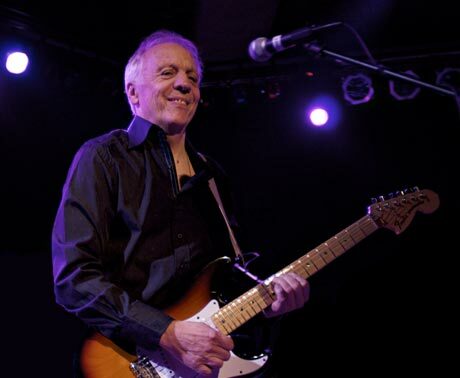 Trower’s guitar success did not fully evolve until he left Procul Harum and started his own Robin Trower Band. This band focused on guitar-based rock and spacey soloing. Trower focuses a lot of attention to music released in 1973-1977, where he gathered five certified gold releases and truly cemented his status among some of rock’s finest guitarists. A review of the concert will be up tomorrow. Enjoy the day!